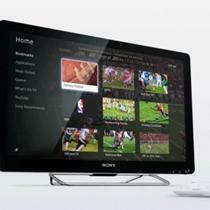 Remote TV viewing is now available for both Sony and Logitech Google TV products. Google TV had a rough start, but there's starting to be some real movement thanks to an operating system update and a few new apps. The latest to be introduced to Google TV is the SlingPlayer. They're calling it the SlingPlayer for Logitech Revue - it works on the other platforms so we're not sure why - and it allows you to do the things that you'd expect from a Sling app. You can watch the shows playing or recorded at home from anywhere you have an internet connection. The SlingPlayer is available as a free download on Google TV now.